After nearly five years of construction and testing, the U.S. military's next satellite with voluminous throughput to pump vital communications to battlefield forces awaits blastoff Thursday night from Cape Canaveral. "The team is focused on mission success and getting this critical capability to the warfighter by launching the most advanced wideband satellite system in the world," said Dave Madden, director of the Military Satellite Communications Systems Directorate at the Air Force's Space and Missile Systems Center. The Wideband Global SATCOM 4 spacecraft, built by The Boeing Company under a $464 million contract signed in 2006, will beam high-data-rate, large-volume communications such as voice, video conferencing, intelligence files and weather information to troops across the Middle East and Southwest Asia, plus supply the bandwidth for routing telemetry and data streams from unmanned aerial drones. The WGS fleet is the Defense Department's highest capacity communications satellites, employing advanced technology to improve the the capability 10 times over the previous spacecraft constellation. 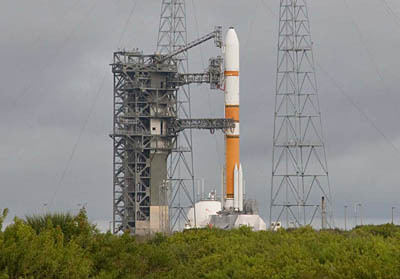 This will be the Air Force's first military communications satellite launch since its Advanced Extremely High Frequency 1 spacecraft was carried aloft in August 2010 only to experience a major problem when the main propulsion system failed to operate because of debris clogging the fuel lines. Although AEHF was built by a different manufacturer and the engine itself isn't from the same supplier as WGS, Madden ordered precautionary inspections to ensure this upcoming WGS 4 deployment wouldn't suffer a cruel repeat. "Yes, we did check out the propulsion fuel lines...This system has an apogee engine similar to Advanced EHF, so we went back and thoroughly checked all of the lines," Madden told reporters in a recent briefing. "To make sure I felt comfortable, I had them do an extra check of the propellant lines to make sure we didn't have any similar issues. Get me once, but not twice." The AEHF 1 was saved through an unprecedented salvage plan that relied heavily on the craft's electric-current thrusters and over 500 maneuvers in a 14-month rescue to finally reach the proper orbit. Its payload is undergoing in-space checkout before entering service later this year to provide U.S. leadership ultra-secure communications links with military commanders. The WGS 4 spacecraft, weighing about 6.5 tons, will need a hefty version of the Delta 4 flying in a configuration known as the Medium+ (5,4) to reach its targeted orbit Thursday night from the Cape. You can follow the countdown and launch in our Mission Status Center with journal updates and live streaming video. Flown only once before, this version of the Delta is distinguished by a five-meter payload shroud and four solid rocket boosters. Many other Medium+ rockets have launched over the years with the smaller four-meter nose cone and only two solid motors. The cryogenic main engine and all four solids will be ignited on the launch pad, rapidly accelerating the 217-foot-tall rocket into the nighttime sky nearly two hours after sunset. The strap-on motors fire for 93 seconds, then burn out and separate from the first stage several seconds later about 22 nautical miles up, with the two fixed-nozzle casings going first and then the motors with movable nozzles coming off moments later. The 47-foot-long, two-piece nose cone made of composite materials that covered the WGS spacecraft during ascent through the atmosphere is no longer needed by the three-and-a-half-minute point into the flight, allowing its jettison 68 miles in altitude and 128 miles downrange from the launch pad. The RS-68 main engine continues its firing through the initial four minutes of the launch by consuming liquid hydrogen and liquid oxygen to climb beyond the edge to space. 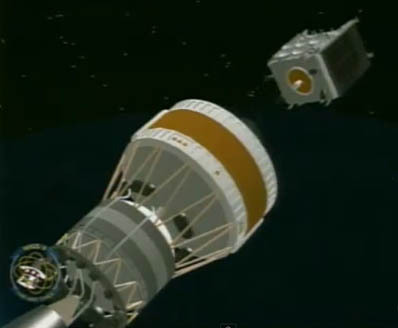 The Common Booster Core stage completes its firing after accelerating the rocket in excess of 11,000 mph, separating 100 nautical miles over the ocean some 220 miles east of the Cape. 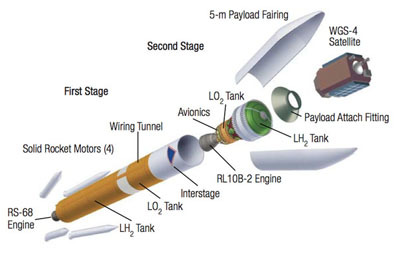 The upper stage's cryogenic RL10B-2 powerplant then ignites for a 16-minute firing that propels the vehicle into an elliptical parking orbit of approximately 100 by 3,700 nautical miles and inclined 25.6 degrees to the equator. Engine cutoff comes over the mid-Atlantic nearly 3,200 miles downrange at a speed of 20,100 mph. The rocket will coast in that temporary orbit only briefly as it nears the western coast of Africa. The engine is restarted at T+plus 28 minuts, 28 seconds to burn for three more minutes that sends WGS 4 toward its egg-shaped transfer orbit looping from 237 nautical miles at its closest point with Earth to 36,108 nautical miles at the farthest point and inclined 24 degrees. The payload separates from the launcher 40 minutes and 32 seconds after liftoff while soaring away from the planet over Madagascar and the Indian Ocean, a moment that occurs 1,400 miles in altitude and 8,000 miles downrange from the launch pad. "WGS 4...will provide important capabilities to the men and woman protecting our freedoms around the world," said Jim Sponnick, United Launch Alliance vice president of mission operations. This launch will mark the 18th for the Delta 4 family of rockets since 2002 and ULA's 57th mission since formation in 2006. The spacecraft will maneuver itself into a circular geosynchronous orbit with a view of the continental U.S. for testing and checkout by mid-March, then relocate to its operational position over the Middle East to enter service in the summertime for U.S. Central Command and U.S. Pacific Command forces. "The launch of WGS 4 is the culmination of five years of dedicated work by the combined Boeing and government team. This satellite represents the first of a new block of WGS vehicles, enhancing the Wideband MILSATCOM capacity currently available to thousands of users around the globe and adding high bandwidth support for a few high-priority users. We eagerly anticipate its operational availability to our warfighters this summer," said Luke Schaub, WGS government program manager. That added bandwidth will be supplied to unmanned aerial drones, an option incorporated in WGS 4 and subsequent craft in the program by modifying the internal pathway of signals for dedicated uplink and downlink channels with three-times-larger capacity.